Free Delivery Mainland UK only 5-10 Working Days. Free Delivery Mainland UK only 3-5 Working Days. 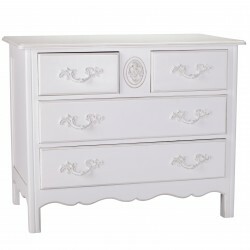 Choose from the wide range of Chest of Drawers by Exclusive Furniture World. Solid wood cabinet with three drawers. The drawers feature a stylish dark grey metal plating on the ..
3 Drawer Venetian Mirror BedsideDimensions: H60 x W30 x D29 cmMaterial: Hardwood & MDF inner Fra..
3 Drawers Rustic Wood Storage Organizer 25 x 15 x 29 cm.Small 3 drawer wooden desktop cabinet. A sty.. Aged Ivory Chateau Chest Dimensions:H83 x W129 x D50 cmMaterial:Mahogany & mdfEAN:7434914850872P.. Aged Ivory Curved Chest Dimensions:H86 x W114 x D51cmMaterial:Mahogany & mdfEAN:7434914850889Pac.. Aged Ivory Ornate Chest Dimensions:H86.5 x W110 x D56cmMaterial:Mahogany & mdfEAN:7434914850865P.. The Allendale wide chest of drawers is finished in solid oak with oak veneers. It features str.. The Allendale chest of drawers is finished in solid oak with oak veneers and features striking heavy.. The Allendale 5 drawer chest finished in solid oak with oak veneers and features striking heavy roun.. Simple but stylish storage space for all your outfits, books, bedlinen and other treasures. The spac..
Alpha Black Gloss & San Oak Chest Of 4 DrawersChest of DrawerBrand: AlphaItem: Chest Of 4 Drawer..
Alpha Black Gloss & Walnut Chest Of 4 DrawersChest of DrawerBrand: AlphaItem: Chest Of 4 Drawers..
Alpha Black Gloss & Walnut Chest Of 6 DrawersChest of DrawerBrand: AlphaItem: Chest Of 6 Wide Dr..
Alpha Black Gloss Two Tone Chest Of 4 DrawersChest of DrawerBrand: AlphaItem: Chest Of 4 DrawersColo..
Alpha Black Gloss Two Tone Chest Of 6 DrawersChest of DrawerBrand: AlphaItem: Chest Of 6 Wide Drawer..